WAPA is pleased to announce the five recipients of the 2017 Praxis Award. There was one first place award, and four honorable mentions. 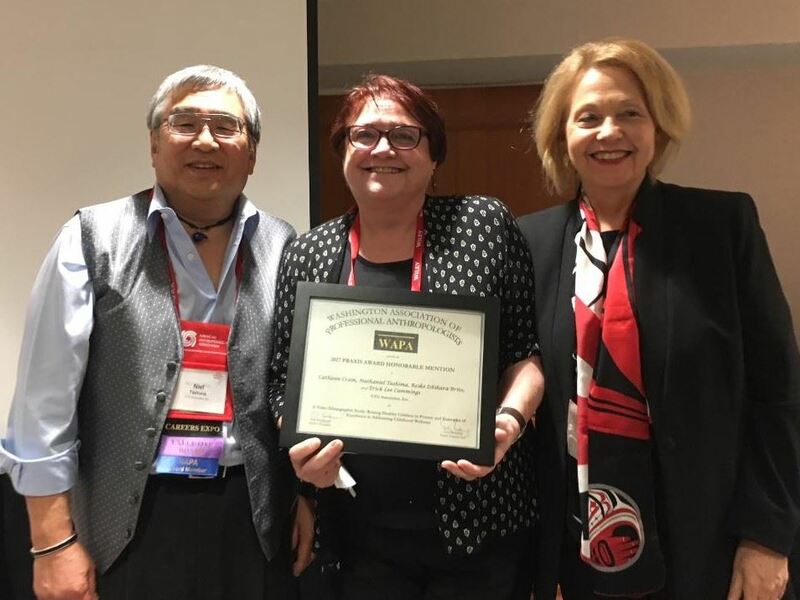 Typically, a maximum of four awards are presented, demonstrating that 2017 was a very competitive year, reflecting the tremendous value of the work being done by anthropologists. 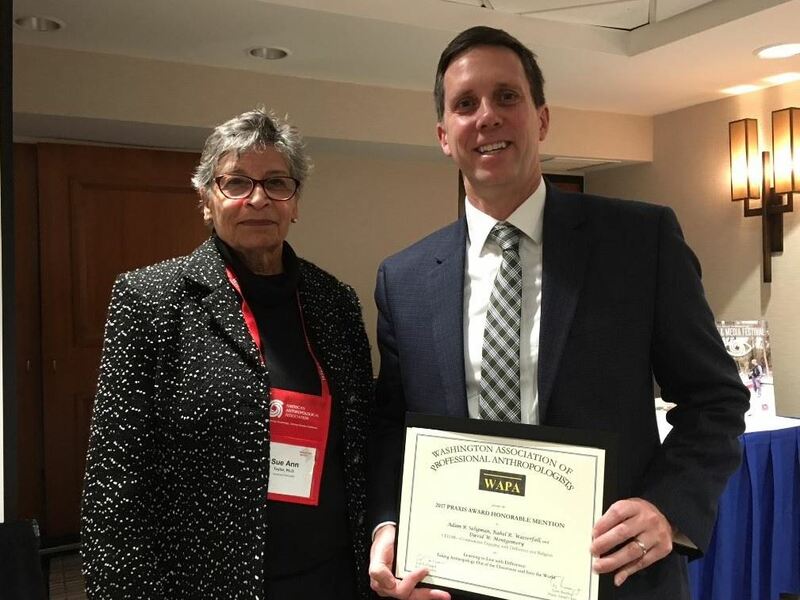 The awards were presented on December 1, 2017, in Washington, DC, immediately following the business meeting of the National Association for the Practice of Anthropology. 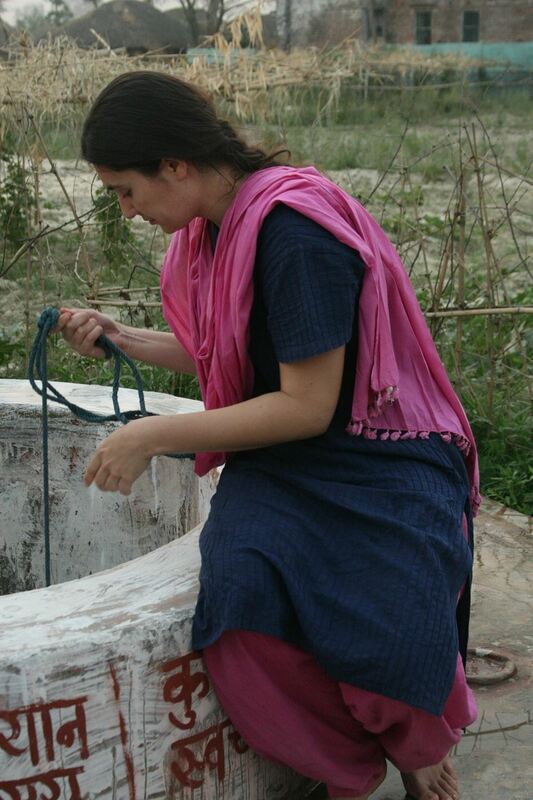 The project application describes how in the flooded areas of North Bihar, India, one of the country’s poorest states, development organizations working on drinking water found that bacteriologically contaminated “dug-well” water was easier to clean than “hand-pump” water, which were polluted with heavy metals. However, dug-wells are historically characterized by caste-based discrimination, and local peoples largely preferred the modern hand-pump. Ethnographic research revealed that hand-pumps, which are promoted by the state and by international organizations, are also power-laden, while a dug-well revival can work to promote self-help and community-building. Instead of merely supplying a solution, the project chose to engage people in conversations about dug-wells, and encouraged knowledge transmission on how to clean them. As a result, several families started to revive dug-wells, cleaning and restoring them at their own expense. By engaging people in conversations, the project achieved the independent and equitable revival of dug-wells by their users. The application also described how a young, European woman was able to get accepted into communities over the course of several years, using patience and cultural awareness and sensitivity. 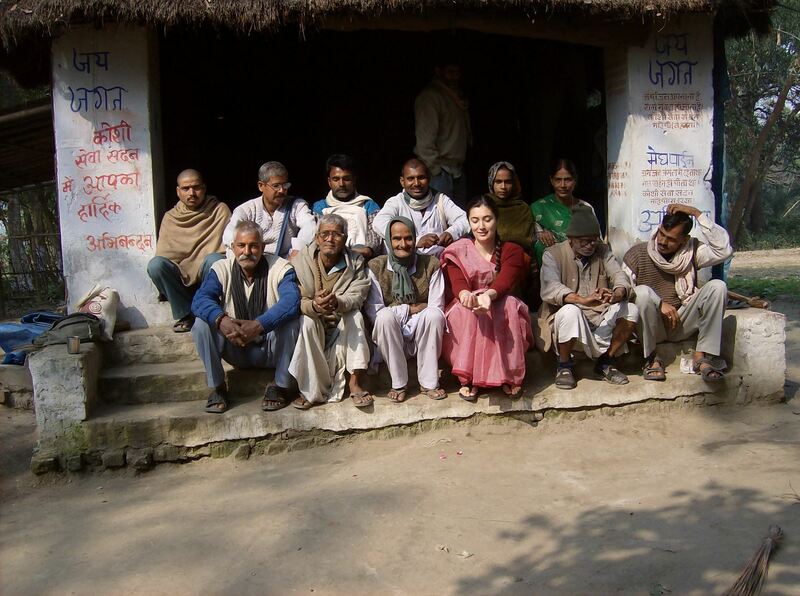 Luisa Cortesi (front row) with one of the five Megh Pyne Abhiyan (MPA) project teams who worked on the dug well project. The team members are Puspa (back row, second from right), Reeta (back row, far right), Aditya (back row, second from left), and the late Pawan (back row, third from right). The front row includes three volunteers of KSS, the Gandhian organization that partnered with MPA on this project. Ram Poddar Babaji (front row, second from right), 90 years old, was particularly supportive, and roamed across rivers and at times the country with the awardee. Luisa Cortesi is a joint Ph.D. candidate in Environmental Anthropology and the School of Forestry & Environmental Studies, Yale University (2018 expected). She has a cumulative total of seven years of applied research in rural India, of which over five years are in North Bihar. She was assisted in her efforts by Megh Pyne Abhiyan (The Cloud’s Water Campaign) set up by Eklavya Prasad, and by five local organizations, namely Samta, Gramyasheel, Kosi Seva Sadan, Ghogardiha Prakhand Swarajya Vikas Sangh, and Water Action. A total of 53 people worked on this project, but her close team was composed by Pawan Bind, Puspa Devi, Pradeep Poddar, Kumod Das, Ramji Poddar, Adith Jha, Reetha Devi. Luisa wishes to express that the support of Prem Kumar Verma, Rajender Jha, Chandrashekar Jha, Ramesh Kumar Singh, Vinay Kumar was invaluable. The LTG Associates team of anthropologists and a videographer developed two, one-hour long video ethnographies for the California Department of Health Care Service, which were focused on healthy families and communities. They were designed to bring the faces and voices of participants and their worlds into direct relationship with policymakers, program developers, and legislative staff and legislators for the State of California. These videos have been used for briefings, trainings, and policy and program development. The videos were co-created with community leaders engaged in innovative community health projects and parents in poor conditions working to raise healthy children. The award application noted that the project could have been carried out by other professionals, but the anthropological difference began with the reframing of the community participant-focused research questions to center on families and their lived experience and context. It continued through the identification and recruitment of participants through the use of social networks. The video interviews and the creation of the presentations depicted the lives of individuals that were then validated by the participants, closing the loop from interview to data to analysis to final video production. "The narrative explains how the team argued for an empathetic, ethnographic approach to elicit the health experiences of families. Importantly, the ethnographers present themselves as learners rather than experts. The videos provide evidence of the team's effectiveness in crafting the kind of empathetic, empowering message they sought to provide policymakers. It's a nice example of ethnographic filmmaking… I love the ethnographic sensibility of this project." Cathleen E. Crain is one of the two founding and Managing Partners of LTG Associates. She is a senior social scientist with over 40 years of experience in health and human services provision, program development, policy analysis, evaluation, training, and technical assistance for international, federal, state, and local governmental and non-governmental organizations. Nathaniel (Niel) Tashima is one of the two founding and Managing Partners of LTG Associates, and has been engaged for more than 40 years in projects that have focused on creating knowledge about families and communities and opportunities for their voices to be engaged in shaping programs and developing polices that effect their lives. Reiko Ishihara Brito is a Research Associate at LTG Associates. Her work experience ranges from serving as a union to working with indigenous communities in Central America. Erick Lee Cummings has more than eight years of professional experience producing, shooting, editing and directing video. He is currently a freelance Digital Filmmaker and Video Editor for various outlets. Clients: Clients at the time of the award included: Plovdiv University (Bulgaria); Uganda Martyrs University (Uganda); Southern Africa Interfaith and Peace Academy (Zimbabwe); KICORA (Tanzania and Berundi); Institute of Resource Governance and Social Change (Indonesia); Yamaguchi Prefectural University (Japan); and Hardin-Simmons University (USA). CEDAR is a global educational network that runs fortnightly programs enabling members of disparate communities to recognize and accept their differences as they work toward a civil society. The group combines a unique, anthropologically informed pedagogy of cognitive learning (lectures), experiential learning (site visits), and affective learning (group work) to build communities that respect difference rather than emphasize sameness. This structure, together with an international and diverse body of fellows, provides a powerful experience that forces participants to challenge their taken-for-granted assumptions about the self, the other, and the terms of interaction, therein creating a new space for living together differently. Unlike other interfaith and inter-communal programs, which play down fundamental dissimilarities between people in favor of emphasizing what they have in common, CEDAR places difference squarely at the top of the agenda. In fact, the key to CEDAR’s approach is the requirement that participants confront one another’s differences—and then learn how to live with them. In two intensive weeks, participants experience unfamiliar religious customs, grapple with beliefs that contradict their own, reexamine lifelong assumptions, and figure out how to share time and space. Rahel R. Wasserfall is CEDAR’s lead anthropologist and Director of Evaluation and Training. She is also a resident scholar at Brandeis University, focusing on evaluation of educational activities in cross-cultural settings. David W. Montgomery, CEDAR’s Director of Program Development, is a Policy Fellow with the American Association for the Advancement of Science and a Research Associate in the Department of Anthropology at the University of Pittsburgh, where he taught for six years as a Visiting Assistant Professor, and Associate in the Central Asia Program at George Washington University. Adam B. Seligman, CEDAR’s Founding Director, is a social theorist in the Department of Religion at Boston University, where he teaches courses cross-listed in the Department of Anthropology. In 2011, then-governor of Maryland Martin O’Malley established the Marcellus Shale Safe Drilling Initiative to assist state policymakers and regulators in determining whether and how unconventional natural gas development and production (i.e., fracking) from the Marcellus Shale in Maryland could be accomplished without unacceptable risks to the environment and the populace. This initiative required research assessing the impacts of drilling on the environment, the economy, and health. A state-wide public health impact assessment of fracking, the first of its kind, was commissioned and conducted by a team of interdisciplinary researchers with input from residents and a variety of other stakeholders. The project represents several innovations, such as the utilization of a health impact assessment, which uses participatory research to foster a relatively high degree of control over research by community members and stakeholders and is meant to equalize power within the research process; and the development of a hazard ranking methodology to assess potential public health impacts, which is a valuable tool that allowed the team to systematically evaluate each hazard related to fracking and provide recommendations to minimize the hazards. Both can be easily adapted by other communities facing similar situations as well as in other settings that entail making decisions with limited information. Although community residents welcomed the potential economic growth brought about by fracking, anthropological analyses led to findings that indicated fracking also generated rapid transformations in meanings of place and social identity, increasing people’s anxieties of environmental and health impacts. 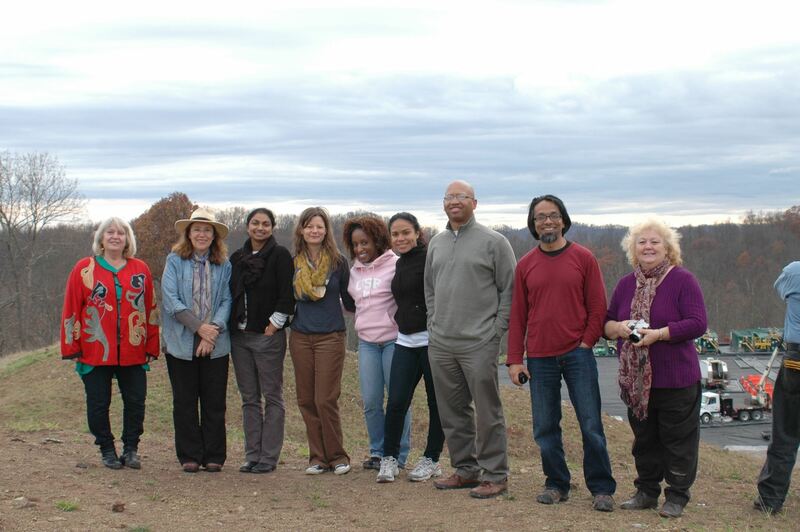 Thurka Sangaramoorthy (third from left) with research team and community members in West Virginia. "I think this project stands as an outstanding example of how anthropology can help people understand key environmental issues, obtain pertinent data, and as a result, help shape policy. The approach used can be used elsewhere, and indeed, this project can be used as a case study for training." Thurka Sangaramoorthy is an Assistant Professor in the Department of Anthropology at the University of Maryland. She was a postdoctoral associate for three years at the U.S. Centers for Disease Control and Prevention (CDC), where she conducted studies using rapid ethnographic assessments and health impact assessments in order to implement practical, timely, and sustainable interventions, and she coordinated trainings in both of these methods for public health professionals. This project aimed to support Oxfam’s Public Health Promotion (PHP) strategies by integrating anthropological approaches into the humanitarian response to the 2014 West African Ebola epidemic. At the time of the project, most people in Oxfam’s areas of operation in Liberia and Sierra Leone had moderate to high awareness of Ebola prevention and treatment information. However, infections continued to flare across the region. In early November 2014, the applicant supported Oxfam’s PHP strategies in Liberia and Sierra Leone by identifying barriers to compliance with Ebola prevention and treatment advice, and by contributing to the development of local-level response activities. She developed rapid qualitative assessments to identify points of friction between Ebola-affected communities and response activities, and offered recommendations for improvements in Oxfam’s strategies. Oxfam PHP teams used these assessments to adjust operations on a daily basis, incorporated recommendations into longer-term strategies, and captured lessons learned for future epidemic responses. Ultimately, this role produced a multi-level engagement with Oxfam’s Ebola response strategy: (1) contributing input to adjust tactics in real time, (2) incorporating recommendations into short-term response and long-term recovery strategies, (3) capturing lessons learned for future epidemic response, and (4) integrating reflexivity into humanitarian response. Olive Melissa Minor is a Mellon/ACLS Public Fellow and a research & evaluation officer with the International Rescue Committee. Her previous work includes identifying barriers to HIV prevention and treatment for transgender Ugandans, and applying anthropology to design health programs for pregnant teens in Cameroon. WAPA would like to thank the 2017 Praxis Award jurors, who spent many hours diligently reviewing and commenting on the award applications. This cycle's jurors included Charles Cheney (NIH, retired); Mari Clarke (World Bank); Laura McNamara (Sandia National Laboratories); and Riall Nolan (Purdue University). The 2017 Praxis Award Committee included Suzanne Heurtin-Roberts, Adam Koons, Jim Stansbury, Sue Taylor, and Terry Redding (chair).